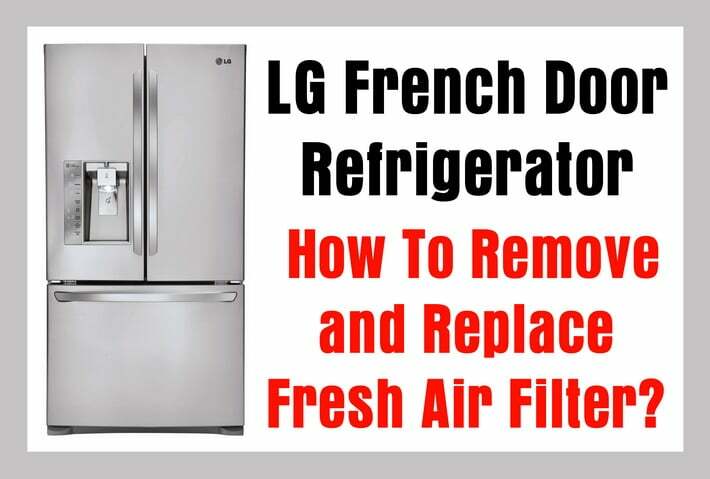 LG French Door Refrigerator – How To Remove and Replace Fresh Air Filter? Looking for LG Fridge Air Filters? LG french door refrigerators have a small but efficient fresh air filter in the inside top of the fridge. 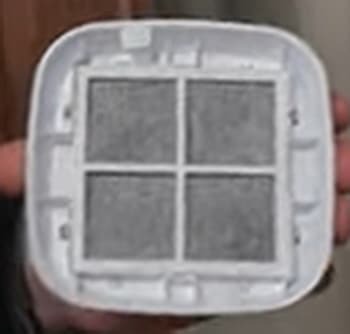 This air filter is recommended to be replaced every 6 months. This is to combat odors and keep your LG fridge smelling clean. 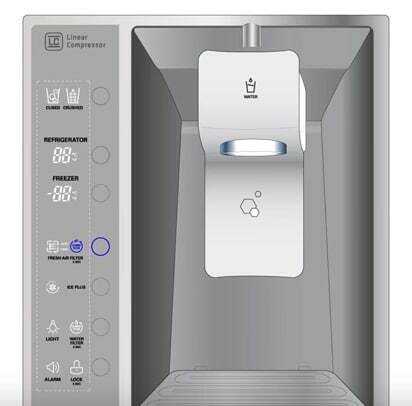 Your LG refrigerator will tell you when to replace the air filter on the display panel with the words “CHANGE FILTER”. Once you see this on the fridge display it is time to replace. 1 – Display panel displays to replace air filter. 2 – Remove air filter cover – turn filter cover to the left and detach. 3 – Old fresh air filter is inside air filter cover. 4 – Remove the old fresh air filter from the cover. 5 – Replace the new fresh air filter into the cover – The side that faces outward will say FRONT. 6 – To reinstall filter cover, hold in position and turn to the right to lock into place. 7 – On the LG display panel, press and hold the AIR FILTER button for 3 seconds. 8 – The air filter button will then reset and turn off. 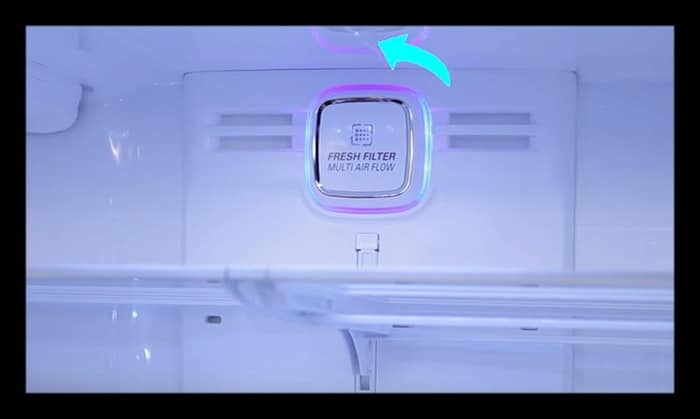 Here is a video by LG to show just how easy it is to change the air filter in your LG refrigerator. 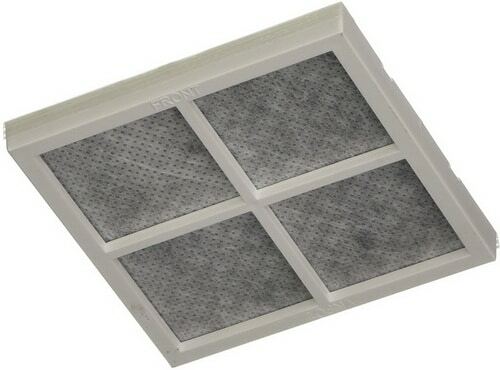 This LG Refrigerator Fresh Air Filter fits models LFX31925SW, LFX31925SB, LFX25991ST, LFX31945ST, LFX329345ST, LFX31925ST, LFX33975ST, LFX29927ST, LFX29927SW, LFX29927SB, LFX28968ST, LFX29945ST, LFX31935ST, LMX31985ST, LMX30995ST, LFX31995ST and LSC22991ST. 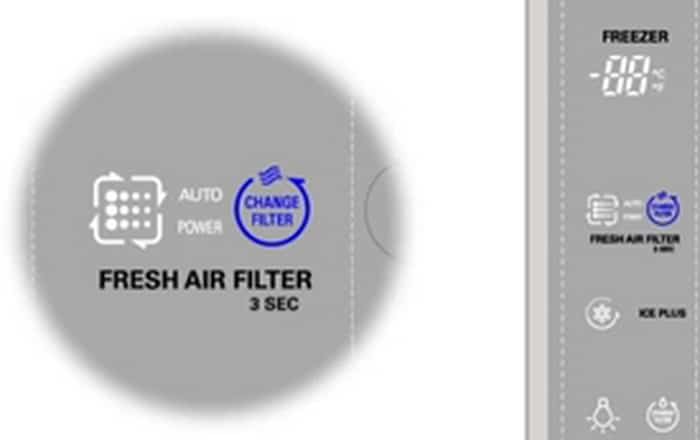 If you have any other issues with your LG fresh air filter, please leave a comment below and we will assist. I replaced my Fresh Air Filter just fine but when I press the Fresh Air Filter button and hold for 3 seconds it does not reset. All it does is switch from Power to Auto (which does not show). Next post: Samsung Refrigerator Freezer Fan Not Working – Defrost? – What To Check – How To Fix?